Teddy Soeriaatmadja’s film tells the story of Maida Lilian Manurung (Atiqah Hasiholan) and her fight to save a school for street kids. Maida set up the school in an abandoned home, but the building is targeted for conversion to commercial use. Maida tries to find ways to save the house, with the help of the devious Sakera (Yama Carlos), and a look into the building’s past helps Maida find an answer to her problem. 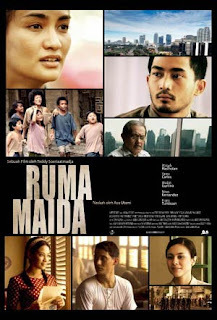 Ruma Maida is a movie of storytelling, romantic, poignant and historical tales are recounted and presented in a creative interveawing plot. The movie offers a strong social message about the ever-widening social gap between the rich and poor, while offering a look at some of the important chapters in Indonesia’s history of independence.